Any of these would also make excellent crafts/activities for the feast of the Holy Family on the Sunday after Christmas, if you just made only the Holy Family rather than the entire nativity set. I made a printable peg doll nativity set– you just paint the heads and the bodies Mod Podge right on. This is a favorite with my kids! I put our playmobile nativity set (one of my favorites) in our rice sensory bin, and this was a huge hit with my kids! See the details here. These printable nativity crafts are available in my Advent Saint pack. Did you know that St. Francis made the first nativity? By far a Catholic Icing favorite, here’s a pirntable nativity set that’s available totally for free. You can print them and glue each figure around a toilet paper tube, or you can print them on cardstock, roll them into a cylinder, and staple them together. This is super fun and kids love being a part of this! 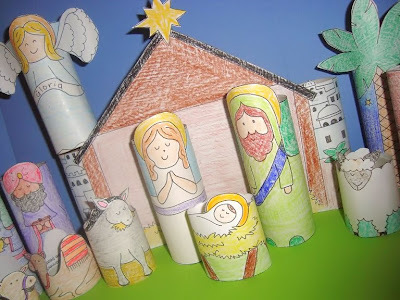 Check out this nativity art project for kids, ideas for crafting the Holy Family here, and more ideas for crafting nativity sets here. You can also find some easy nativity cookies here. Find all my Advent and Christmas Posts here.